We’d love your help. Let us know what’s wrong with this preview of Hope Is a Ferris Wheel by Robin Herrera. To ask other readers questions about Hope Is a Ferris Wheel, please sign up. is this nonficton or ficton? This is a review copy I won in a GR giveaway. I was worried this book would be too cutesy for my taste. When a ten-year-old girl says, "Heavenly Donuts!" I'm going to assume she's making a reference to the local snack shop. When I find out that's what passes for swearing in her family, I'm going to nerd-out and mutter about capitalizing that "D."
But then I'm going to get over myself and enjoy a sweet, funny story. And I'm going to give the author extra credit for refusing to buy into the stereoty This is a review copy I won in a GR giveaway. But then I'm going to get over myself and enjoy a sweet, funny story. And I'm going to give the author extra credit for refusing to buy into the stereotype of the teenaged sister disdaining her younger sister. Star and Winter are authentically close, and affectionate without being mawkish. I'm going to give the author a lot of credit for making that work, and making it look easy. And then I'm going to freak out about two-thirds of the way through the book, because HEAVENLY DONUTS, Robin Herrera drops two big bombs without raising her voice. I had to screech to a halt twice in two pages and run right over to Goodreads to squawk. Then I had to be glad I'm confined to bed with a cold, because I could skip doing the dishes or anything else that would get in the way of finishing the story in one sitting. No spoilers here. I will say that there's a lot left up in the air at the end of the book, and I'm still deciding how I feel about that. Then again, it does fit in very well with the hope-filled theme of the book. So, yeah. I'm okay with that. I feel like I may have enjoyed this book when I was younger, but... it was just a meh for me. It's the first Middle Grade book I've read in a long time. In elementary school, I was apart of The Hellen Ruffin Reading Bowl. Many of the books on the lists each year are award-winning and great books, so when this one landed the list a year or two ago, I knew I should read it. The main character was ten and adorable, but frankly, she got on my nerves. I hated the ending. I get that it was a "left up I feel like I may have enjoyed this book when I was younger, but... it was just a meh for me. It's the first Middle Grade book I've read in a long time. In elementary school, I was apart of The Hellen Ruffin Reading Bowl. Many of the books on the lists each year are award-winning and great books, so when this one landed the list a year or two ago, I knew I should read it. The main character was ten and adorable, but frankly, she got on my nerves. I hated the ending. I get that it was a "left up to the reader" type thing, but it very much frustrated me. I did like the poetic-type feel to the book, but.. it all felt so mediocre. three stars. Star, a 10 year old girl, lives in a trailer park called Treasure Trailers. She does not have any friends, and is teased due to her "mullet-like" haircut. Our quirky narrator is very lonely due to her lack of friends, an absent father, and a confusing relationship with her sister. Gradually, through her trailer park club (turned Emily Dickinson club), Star begins to form several tentative friendships. By the end, Star has made several fast friends, straightened out her relationship with her sister, and come to an understanding concerning her father. I am definitely going to use this book next year in my 7th grade English class (self-contained/lower readers). The main character in the book is in 5th grade, so has a young view of the world, yet I still feel that this book can be used in a 6th/7th grade classroom. Star Mackie is a spunky young fifth grader with blue hair from the trailer park. She lives with her mom and her older sister Winter, a writer that Star adores. This adoration, mixed with the hardships of making new friends when you're the new girl, inspires Star to start a new club at school when she falls in love with the poems of Emily Dickinson. Over the course of her shaping the Emily Dickinson club, Star learns how to be herself, no matter how different Four and a half stars, rounded up. Star Mackie is a spunky young fifth grader with blue hair from the trailer park. She lives with her mom and her older sister Winter, a writer that Star adores. This adoration, mixed with the hardships of making new friends when you're the new girl, inspires Star to start a new club at school when she falls in love with the poems of Emily Dickinson. Over the course of her shaping the Emily Dickinson club, Star learns how to be herself, no matter how different her and her family may be, how to make (and keep) friends, and how to let go of the past and hope for the future. I was blown away by this book. Though it may be categorized as middle grade/children's fiction, this book reaches right to the heart, no matter what the reader's age is. In no way was I expecting to have such deep and stirring feelings about a ten year old girl with a blue "mullet". And yet, I did. This book traverses a broad range of emotions- Star made my heart break, made me angry at some of her little classmates, and made me swell with hope that her life and her family would be okay after all. Sprinkle in some Emily Dickinson poetry and some sassy humor, as well as a broody older sister, and you have Hope Is a Ferris Wheel. I felt that the characters were all fairly realistic, and as I sort of mentioned above, are incredibly relatable even though they are ten and sixteen, and I am in my twenties. I'm old enough to have gone through some of the Mackie family's issues, or know friends who have, and it made this book an extremely contemporary, real look at life. I admit that in addition to the tie in of a favorite poet, Dickinson, the main reason why I wanted to read this book was the cover art. I know that's bad and everything, but the cover of this book is even more gorgeous in person than the internet suggests. I love it. I do feel like the end rushed a bit too quickly, but other than that I have very little issue with this book. I really wish I could have heard more of Winter and Star's story, but it wasn't a cliffhanger and I completely understand the author's decision with ending the book the way she did. This book is perfect for kids from middle school up to adult age, and I especially recommend it for those who were/are the "different" kid, the new kid, or the picked on kid. I also recommend this to anyone with an interest in poetry, as it is a heavy theme throughout this book. I can't remember the last book I read that made me feel so much. Incredible. Review to come! Weeks have passed since I finished reading an advance copy of HOPE IS A FERRIS WHEEL, and I just can't get it out of my head. Star, with her love of Emily Dickinson and yearning to make a true friend, is the heart and soul of the novel, but terrific supporting characters (particularly Star's punk older sister Winter) also help the story feel incredibly real. I need to give a shout-out to th I can't remember the last book I read that made me feel so much. Incredible. Review to come! I need to give a shout-out to the story's structure and the overall quality of the writing, too. There's a scene around page 150 that just completely broke my heart; I didn't see it coming, but in retrospect, the author set it up perfectly. And I love how the book ends--with just enough ambiguity that different readers will surely imagine different conclusions for the characters. It would make for a great conversation within a classroom. Star's family just moved and she needs some friends, so she starts a club at school. Star comes off as a bit too naive, even for a 10-yr-old fifth grader. Her friendship dilemma is solved by the end of the book but two other important plot lines (Star's possible relationship with her father and her sister Winter's situation) are left unresolved. For this reason, this middle grade novel feels incomplete and not entirely satisfying to me. Strong tie-ins to both social studies and language arts. Rea Star's family just moved and she needs some friends, so she starts a club at school. Star comes off as a bit too naive, even for a 10-yr-old fifth grader. Her friendship dilemma is solved by the end of the book but two other important plot lines (Star's possible relationship with her father and her sister Winter's situation) are left unresolved. For this reason, this middle grade novel feels incomplete and not entirely satisfying to me. Strong tie-ins to both social studies and language arts. Realistic portrayal of working-class poverty. While this family has financial and other struggles, they are not an overly damaged family. This book can help curb the negative stereotypes of living in a trailer, and working-class poverty in general. I also like the discussions of poetry and metaphors as well as Star's vocabulary assignments/stories. Star lives with her Mom and older sister, Winter, in a trailer park in northern California. Where they used lived in Oregon, it wasn't weird to live in a trailer. Star finds out the hard way that telling everyone she lives in a trailer park isn't going to make her a lot of friends in her new school. But Star doesn't give up. She starts an after school club to meet people, a club that morphs from The Trailer Park Club into the Poetry club (by way of The Emily Dickinson Club). Poetry helps her to better understand her troubled older sister as they both deal with issues no child should have to face. There are a lot of things I like about this book, but a few that kept me from really loving it. The writing was fine. I liked getting to know Star through the vocabulary sentences she does for her English class, and I appreciated that poetry, but especially Emily Dickinson, was such an integral part of the characters' development. This is definitely a text that could be used in many ways in the classroom because of the poetry aspect, but also because of other subject matter that's addressed such as poverty and teen pregnancy. This was a story I wanted to love, because I appreciated that it's a glimpse into a troubled family life from the perspective of a determined 10 year old. But the character of that determined ten year old, Star, was the thing I had the most trouble believing. I can perhaps accept that Star had no idea that telling her classmates at her new school that she lived in a trailer park would make her the center of ridicule. Where she came from most of her classmates had the same or similar living situation, so I guess that could make sense. But really I think Star would have picked up on enough social cues to make her a bit wary of boldly telling everything where she lives. After realizing that other kids are going to pick on her for this, she decides to create the Trailer Park Club, so other kids can get to know her and see that people like herself aren't trashy, and so she can hopefully make some friends. Again, it's not that I don't find this an admirable decision, but I don't really find it realistic. Eventually, Star decides to change her club to the Emily Dickinson Club after studying the author's poems in class. That makes sense, but it doesn't make sense to me that Star would get upset when those in the club want to change it to just The Poetry Club because they're genuinely excited about discussing all sorts of poems, not just those by Dickinson. Star somehow sees this as her losing control of the club. But her whole reason for starting the club in the first place was to make friends. Now she has a small group who are engaged in genuine discussion, but she considers disbanding the club just because they've branched out into other subject matter. I'm not quite sure how that makes sense. So while I found Star's character to be positive and admirable, I also think she's a bit too positive and admirable for me to really find her believable. Also, there were several story lines left without resolutions, and they were things I really cared about. Overall, a nice story that with some changes could have been a four star rating. Star Mackie is ten-years-old, recently moved from Oregon to northern California because her teen-aged sister, Winter, has to go to a "delinquent" school after getting expelled for starting a very different writing club. Star, Winter, their single mom, and mom's best friend Gloria, all live in a trailer park and the kids in Star's class make fun of that and also Star's blue hair, styled in a botched layer cut by Gloria that looks like a mullet. Star is a resilient girl and and decides to start a Star Mackie is ten-years-old, recently moved from Oregon to northern California because her teen-aged sister, Winter, has to go to a "delinquent" school after getting expelled for starting a very different writing club. Star, Winter, their single mom, and mom's best friend Gloria, all live in a trailer park and the kids in Star's class make fun of that and also Star's blue hair, styled in a botched layer cut by Gloria that looks like a mullet. Star is a resilient girl and and decides to start a Trailer Park Club to help her classmates see beyond their stereotypes. With three members and later five, eventually the club evolves into an Emily Dickenson Club, because Star's teacher introduces the poet in class. Star uses her writing skills to write a poem, Hope is a Ferris Wheel, and she shows who she is through the vocabulary writing lessons, which she refuses to hand in, causing her to go to detention. The idea of ferris wheels comes to play in various ways in the story. Life has its ups and downs and sometimes it seems like its spinning out of control, but when you're at the very top you can see so many things like a man, who you think is your father, walk away before you come down from the ferris wheel to finally meet him,"but you never lose sight of what you want." Robyn here. I too desire to be a cat lady someday, but my husband refuses to succumb to the joys and shenanigans of living with a minion of cats. Luckily my parents are experts and I can visit them any time. Thank you for writing Hope is a Ferris Wheel. Star is a character I could connect with since I grew up in a trailer house too and experienced firsthand the stigmas that come with it. I did not have a mullet, and even if I did I would never admit it. Thank you for bringing to life characters with real conflicts that many kids have to face today. I've gushed to my 7th and 8th grade students about your book, and now that I'm finished with it, I will recommend it again and again and possibly slip it into their backpacks when they're not looking. Okay, probably not that last one since everything in their backpack gets lost or severely damaged. This book is about a ten-year-old girl named Star Mackie that lives in a trailer park with her flaky mom and her melancholy older sister, Winter, who Star looks up to. her classmates tease her because of where she lives and because of her layered blue hair. They would laugh at her when the kids at school would see Star walking by. When Star starts a poetry club, she develops a love of Emily Dickinson and, through Dickinson’s poetry. She learns some important lessons about herself and comes to te This book is about a ten-year-old girl named Star Mackie that lives in a trailer park with her flaky mom and her melancholy older sister, Winter, who Star looks up to. her classmates tease her because of where she lives and because of her layered blue hair. They would laugh at her when the kids at school would see Star walking by. When Star starts a poetry club, she develops a love of Emily Dickinson and, through Dickinson’s poetry. She learns some important lessons about herself and comes to terms with her hopes for the future. This book really related to me because it was about a girl that is in 5th grade and a sister that was in high school. In Stars life there's a lot of thing that happen in her life that also happens in my life, for example Star is in a public school, she got made fun of for where she lived, and she is very outgoing and goes for anything that she wants. This relates to me because once I was in a public school and I didn’t stand out or in other words very popular. I think that I am very outgoing and a little shy at moments just like Star is. If you are a boy this is NOT the book for you. If you like books that on the cover don’t give you a lot of information then you will like this book. I hope that there will be another book in this series. I didn’t like the ending because it felt like there was supposed to be Hope Is a Ferris Wheel 2. I would like the ending if it would tell the readers that their will be another book coming and not finish just like the middle of the book or the end. For the lesson of the book is very obvious. This book got me thinking about what will happen to me as I go on with my life, whether it is good or bad. I hope everything is good but there might be a couple bumps in the road. This is a good book because it teaches me about life lessons. I don’t like those books that don’t teach you any life lessons. When I finish a book I want to have learned something about the world or about me! I have not liked a book in a long time but this book is really good. I liked how the author gave me visual details of every thing that he was talking about. I am a very visual person, so that really helped me. If you are a very visual person this a really good book for you. I was very interested in how the book didn’t really have a plot. The only change I say in the book is when Star started going to detention for not turning in her spelling sentences and when she made her second writing club, which worked out way better than the first that went down a lot when Star and Edie got in a fight. The fight was a food fight. The only confusing thing about Hope Is A Ferris Wheel is the book title. The reason I found this confusing is because it didn’t tell you why it was called that until the end of the book. This book is called Hope Is A Ferris Wheel because when Star was little she remembers that she would go to the fair with her dad. The reason they put the Hope part is because with an unforgettable voice with a lot of heart, Hope Is a Ferris Wheel is the story of a young girl who learns to accept her family and herself while trying to make sense of the world around her. Ten-year-old fifth-grader Star Mackie has just moved into a California trailer park (right beside the dump) from Oregon with her mom and sister. The move has made it hard for her to make new friends, because her classmates tease her about her home and her "layered" dyed blue haircut. In order to help combat this Star decides to start up a new club, the first iteration is about trailer parks and then it morphs into a club dedicated to her newfound love of Emily Dickinson's poetry. Through this po Ten-year-old fifth-grader Star Mackie has just moved into a California trailer park (right beside the dump) from Oregon with her mom and sister. The move has made it hard for her to make new friends, because her classmates tease her about her home and her "layered" dyed blue haircut. In order to help combat this Star decides to start up a new club, the first iteration is about trailer parks and then it morphs into a club dedicated to her newfound love of Emily Dickinson's poetry. Through this poetry, Star learns to accept herself, her family, the world around her, and come to terms with her hopes and dreams for the future. I am very lucky to have found an ARC of this wonderfully optimistic and heartening story despite the realities of Star's home and school-life. Star has a big heart and is filled with all kinds of hopes and dreams, and like Kathi Appelt's blurb says I would like to be a part of her club. This is one of those stories that could easily attract readers of all ages, from upper elementary and middle school age following Star's struggles as the new kid, to teens invested in broody Winter's tale, adults watching the presentation of a single mom through Star's eyes, and anyone interested in poetry. I enjoyed reading this story from Star's perspective. She has a distinct voice and a big heart (and, yes, I know I already said that, but it's worth saying again). It's really difficult not to fall in love with her character. I also enjoyed getting to know the members of her club, especially Eddie and Genny. They are real scene-stealers! I could honestly say if there was an adult or YA retelling of this story from either Carly or Winter's perspective I would read it in a heartbeat. There are some pretty heavy moments in this story involving Star's family, but I don't want to spoil them if you haven't read it yet. There is a fantastic moment when the title really makes sense on page 124 of the ARC. I know you're not supposed to quote without comparing it to the finished copy, but I want to in order to give you an idea of what I mean, especially since the final came out about eight months ago now. "...hope is a Ferris wheel, because you can be far away from something, really wanting it, and the wheel can bring you closer. And sometimes you can step right off, but sometimes the wheel doesn't stop spinning, and you keep moving around and around in a circle. But you never lose sight of what you want." If that little snippet doesn't want you to invest some time in Robin Herrera's Hope is a Ferris Wheel, I'm not sure what will. I will most definitely be keeping my eyes open for more from Herrera in the future. I'm hoping this middle-grade novel will be nominated for the 2015 Newbery Medal. Check out its wonderful book trailer here. Robin Herrera’s Hope is a Ferris Wheel is a profoundly honest, sometimes starkly so, yet inspiring and hopeful coming of age story about one girl’s search for acceptance and truth. Real and immensely moving, with a wonderful heroine, Hope is a Ferris Wheel is such a lovely, memorable middle-grade contemp. Ten year old Star Mackie has just moved to a new town with her mother, older sister Winter, and her mom’s best friend Gloria. Made fun of at school for living in a trailer park and for her layer Robin Herrera’s Hope is a Ferris Wheel is a profoundly honest, sometimes starkly so, yet inspiring and hopeful coming of age story about one girl’s search for acceptance and truth. Real and immensely moving, with a wonderful heroine, Hope is a Ferris Wheel is such a lovely, memorable middle-grade contemp. Ten year old Star Mackie has just moved to a new town with her mother, older sister Winter, and her mom’s best friend Gloria. Made fun of at school for living in a trailer park and for her layered (totally not a mullet) blue hair, not even Winter, who Star adores, can solve her problems. In hopes of being accepted by her peers, Star starts an Emily Dickinson club and ends up finding the friends, truth, and self acceptance she never realized she needed. While appropriate for its intended audience, Hope is a Ferris Wheel is far from a simple, cutesy middle-grade read; it has surprising and captivating depth. Herrera deftly explores heavy topics (poverty, bullying, teen pregnancy, abandonment, etc), through the eyes of ten year old Star, with honesty, heart, and humor. There’s so much about this story that is relatable! Even if you’ve never lived in a trailer park or struggled financially, Star’s self-doubt, longing for acceptance and love, and need to make sense of the world around her, are things that we all grapple with. Herrera has given Star such a memorable, pitch-perfect voice! There’s just something so real and refreshing and endearing about Star. I love her determination, creativity, and compassion. Winter, Star’s sixteen year old sister, is a firecracker of a character: she’s feisty, witty, wise beyond her years, yet desperate for many of the same things Star longs for. The relationship between Star and Winter is probably my favorite aspect of the book, so it’s a good thing it’s so fantastically crafted and developed! The love, respect, and mutual need between these two girls is so deeply felt. I must also mention Genny, one of Star’s classmates and eventual friend, because she is too awesome. I absolutely love this sweet, plucky, funny girl! And as a wordnerd, I’m so thrilled that Herrera gave Star a love of poetry! The interaction between the members of Star’s club (and there are some surprising members), as they smartly discuss poetry, are some of my favorite scenes. My Final Thoughts: Star’s story isn’t sweet or simple or wrapped up in a pretty bow, nor should it be. It’s honest and real and relatable and surprising in its complexity and depth. Hope is a Ferris Wheel is a palpably felt middle-grade contemp. that left me hopeful and thoughtful. I read the book Hope is a Ferris Wheel by Robin Herrera. It is a realistic fiction book about Hope, a 10 year old girl from Oregon, who just moved to California and lives in a trailer park with her sister and her mom. Hope has to adjust to her new life in California, while also trying to find her father and organizing a club at school to get friends. With some unexpected twists and turns throughout the book, you won't be able to put it down. This book really shows you that no matter how hard life can be, always keep trying because with enough effort you can do whatever you set your mind to. 10 year old Star so reminds me of one of my relatives who wore her hair spiky and loved wearing an army jacket and combat boots. But, unlike Star, she wasn't concerned about making friends and fitting in, she forged her own path. I can, however identify with the feelings of looking up to your big sister and everything written felt true to those feelings. Its wonderful how Herrera incorporated poems and metaphors and writing vocabulary words into the story in a way that doesn't come off as an edu 10 year old Star so reminds me of one of my relatives who wore her hair spiky and loved wearing an army jacket and combat boots. But, unlike Star, she wasn't concerned about making friends and fitting in, she forged her own path. I can, however identify with the feelings of looking up to your big sister and everything written felt true to those feelings. Its wonderful how Herrera incorporated poems and metaphors and writing vocabulary words into the story in a way that doesn't come off as an educational lesson but adds lovely layers to the story. And the friends that Star makes as she begins to morph her Trailer Park Club into a Emily Dickinson Club, well they all bring something different to the table and make for a fun story. This is another book with some thought provoking topics (I'm not going to list out these ones because well spoilers..) but Herrera presents everything with honesty and I believe stays true to the emotions. My favorite part of the book is when the club is sitting around and they each come up with a metaphor for what they think "hope" is, beautiful book. As an added bonus the back of the book includes a reader's group guide presenting questions that reflect on the themes and various plot points. There is also a review of some of the poems from the book to have the reader think about what these poems mean to them. I can see Hope Is A Ferris Wheel getting gobbled up by lots of school libraries and teachers who I hope will include some of the authors suggested activities into their lesson plans it's such a lovely, honest book. I'm hanging on to this one, because I really want to re-read it again. Hope is a Ferris Wheel has to be one of my favorite books. Robin Herrera did an amazing job with this book. I love how she wrote it the book just dragged me in, deeper and deeper the more I read. Robin puts the book in such word that you want to keep reading. But when you get to the end you’re sad and re-read it over and over again until you know the whole story by heart. My favorite character is Star (duh, she’s the main character), she has to be my favorite character because the way she acts. Hope is a Ferris Wheel has to be one of my favorite books. Robin Herrera did an amazing job with this book. I love how she wrote it the book just dragged me in, deeper and deeper the more I read. Robin puts the book in such word that you want to keep reading. But when you get to the end you’re sad and re-read it over and over again until you know the whole story by heart. My favorite character is Star (duh, she’s the main character), she has to be my favorite character because the way she acts. The way how she doesn’t care how people think of her. Like that is really rare, to be that confident. Star admires her sister dearly, Winter, I like to think that I know Winter and Star because there’s so much to know. The author gives so much detail into this story. Which is a reason I adore this book. And one other reason is because the characters themselves. How they act, talk, and react to things. They’re all different but the same, in ways. I went back and forth between giggles, and sad faces while I read Hope Is a Ferris Wheel. Star will capture your heart with her refreshing naivety (that's a word right?). Then you will feel all sad as she loses it through her hurdles. There are secrets, and you discover right along with Star that everybody caries some sort of baggage and we're usually not exactly who we appear to be. Star had to learn on her own that relationships are complicated. Some people are great at it and others are not and I went back and forth between giggles, and sad faces while I read Hope Is a Ferris Wheel. Star had to learn on her own that relationships are complicated. Some people are great at it and others are not and that it's ok if everybody doesn't like you as long as you like yourself. That's one thing I find amazing about the story. Despite everything that happens, including all the teasing at school, Star remains true to herself (mostly). She also has a way with her vocabulary assignments that will make you laugh or shake your head. The special touch here (among many others) is how Star connected with poetry because she could relate a specific poem to a person in her life and I do the same (even though I'm not a big fan of poems). So I enjoyed the poems featured in the book, especially the one titled "Hope Is a Ferris Wheel". This was such a character driven story. I wanted to give Genny a high five. I wanted to smack Denny on the head. I wanted to hug Eddie. I wanted to hug Winter, and their mom (despite some poor parenting decisions that she made). I mean, every single character is memorable and I'm sad the story was over too soon. Oh, and now I'm craving donuts plus every time I think about the word "bras" I can't stop laughing. HOPE IS A FERRIS WHEEL by Robin Herrera is lovely. I don’t use that word lightly because for some that translates to precious, which is not my thing and not this book. But the descriptive that keeps coming to mind when I think of this book is “lovely,” so I’m letting it ride. Robin’s novel is gentle and kind and a little brutal and true. Remember that time when you first discovered that what you considered normal was not the norm? I remember it distinctly, in the fifth grade, and it was shocking, HOPE IS A FERRIS WHEEL by Robin Herrera is lovely. I don’t use that word lightly because for some that translates to precious, which is not my thing and not this book. But the descriptive that keeps coming to mind when I think of this book is “lovely,” so I’m letting it ride. Robin’s novel is gentle and kind and a little brutal and true. Remember that time when you first discovered that what you considered normal was not the norm? I remember it distinctly, in the fifth grade, and it was shocking, and for weeks afterward the world seemed to be in really sharp focus. Whether that moment was encouraging or terrifying for you, I think a lot of us were marked by it. Robin handles that new awareness and its aftereffects beautifully in HOPE IS A FERRIS WHEEL. Like all good books, HOPE IS A FERRIS WHEEL does a lot in a small space, but one of the elements I particularly appreciated is how Star rebels against being pigeonholed into a stereotype, yet unconsciously pigeonholes others into a stereotype, too. Because isn’t that how it works? We all have our biases, and it’s only by becoming aware of them that we overcome them. Star models the path of change so perfectly, Robin basically has renewed my hope for the world. Star Mackie comes up with an idea to make friends at her school -- a trailer park club. Maybe if kids understood a bit about where she lives, it will be easier to make friends. The small group of misfits who show up are not what she had in mind. Things go sideways when the club decides to discuss Emily Dickinson instead. HOPE IS A FERRIS WHEEL is a touching read. Herrera gives Star an honest and memorable voice. The wit and intelligence that Star shows in her vocab words made me smile. And while Star Mackie comes up with an idea to make friends at her school -- a trailer park club. Maybe if kids understood a bit about where she lives, it will be easier to make friends. The small group of misfits who show up are not what she had in mind. Things go sideways when the club decides to discuss Emily Dickinson instead. "...the postcard itself wasn't a hope; it was a dream. And dreams need to fly." Hope is a Ferris Wheel by Robin Herrera has a very strong message to tell about accepting the truth with a wonderful heroine. Hope is a Ferris Wheel is such a lovely, honest, inspiring and provoking life changing story. Star lives with her mom and sister , he dad moves from town to town not knowing him . One of the toughest moments in her life is not having the quality with her dad. She has to live with people she has never liked , moving every year having to meet new people. A main element this book hits is climax where star decides to send a postcard to her father for him to finally have her address and possibly send one back. She had the hope that he would finally send one back and to get to know he’s father. “Hope is a Ferris wheel, It takes Low and High And when you reach the Top,It’s like you can touch The Sky! And when it takes you Down Hope becomes A Thing That, When you’re getting Off, You take With you to Bring”. It’s referring to the difficult times having to move around meeting new friends new people not having her fathers support, but having star’s mother being there for her. A huge message being send from this story is that hope comes and goes you may not have the easiest life but after all it gets better. The characters played a part in it having her dad far gone moving from town to town not wanting to find his family not being able to see him since star was six years old, with her sister always being moody and not understanding, her mother not communicating with her and lastly the classmates she surrounds herself by, having to survive only with her best friend Genny . There’s many reasons why I enjoyed reading this book, it’s full of adventures and solving real world problems. This book would appeal to people that either have struggled with losing a family member , having a tough time in school, moving a lot or to people with curiosity of other people’s problems and how they survive them. Hope is a Ferris wheel implicates how hope comes and goes like a Ferris wheel , there’s ups and downs but at the end of the day we survive . 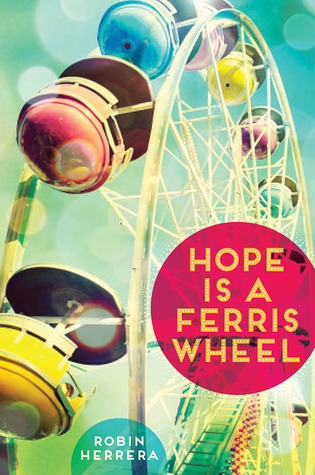 Other books similar to hope is a Ferris wheel are “Half a Chance ” by Cynthia Lord or “Every Day After” by Laura Golden. "Everyone at Pepperwood Elementary knows that I live in Treasure Trailers, in the pink-tinted trailer with the flamingo hot-glued to the roof. The problem is, I only told four girls." I am always excited to see books break the "trailer park resident" stereotype, and the writing in the first chapter was so snap-crackle-pop I couldn't wait to dig in. Unfortunately, everyone in this book seemed like more of a trailer park stereotype than Star and her family, so that wasn't real enjoyable. Star was c "Everyone at Pepperwood Elementary knows that I live in Treasure Trailers, in the pink-tinted trailer with the flamingo hot-glued to the roof. The problem is, I only told four girls." Lovely depiction of the reality of what it’s like for a kid to live in poverty, in a trailer park. As much as I enjoyed the story, the protagonist simply wasn’t believable as a ten-year-old. What child that age uses the word maddening? The author wanted the kid to do something foolish which caused a lot of trouble for herself and kick-started the story so she pegged her age at 10 and used that to explain her behavior. (Even then it didn’t work, in my opinion. A ten-year-old growing up in poverty Lovely depiction of the reality of what it’s like for a kid to live in poverty, in a trailer park. As much as I enjoyed the story, the protagonist simply wasn’t believable as a ten-year-old. What child that age uses the word maddening? The author wanted the kid to do something foolish which caused a lot of trouble for herself and kick-started the story so she pegged her age at 10 and used that to explain her behavior. I was willing to put aside my skepticism and I did enjoy the book, but the protagonist spent the entire thing speaking like either a middle-aged woman or a teenager. Though she did often reason like a very naive and credulous child. It was a bit head-spinning. I had a group of sixth grade girls who loved this book a couple years ago. It has an appealing title and cover, so it doesn't take much to get this one into a reader's hands. Ten-year-old Star lives in a trailer park with her mom and older sister, Winter. Much of the book centers around Star and her relationships with her mom and sister, Star's attempt to make friends and create a club at school, and her lack of a relationship with her father - whom she has only seen once from a distance. I appre I had a group of sixth grade girls who loved this book a couple years ago. It has an appealing title and cover, so it doesn't take much to get this one into a reader's hands. I appreciate how the book shows that even though Star lives in poverty (as evidenced from the trailer, talk of food books, her mother's lack of a vehicle, and so forth), her family is still caring and supportive. Yes, her family certainly has their struggles, and her mom isn't always forthright, but ultimately they love and care for one another. I wrote HOPE IS A FERRIS WHEEL and love love love reading. I read a lot of comics these days, and less fiction, but I'm trying to get back into the prose world. Just a quick note: I do not check the notifications here very often! I do add books, especially when I have something to say about them.